Haaker Equipment Company offers a variety of parking lot sweepers and vacuum sweeper trucks for sale. 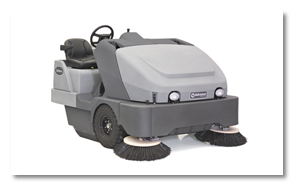 Our parking lot sweeper suppliers are some of the best sweeper companies in the world such as Nilfisk-Advance, American-Lincoln, and Nite-Hawk. Our parking lot sweepers, vacuum sweepers and road sweepers will help you clean your parking lot faster and with greater productivity. They are available in high productivity litter sweeper/vacs with large sweep paths, high capacity sweepers, vacuum sweepers, all at affordable prices. If you are looking for new, used or rental sweeper trucks, give us a call today! 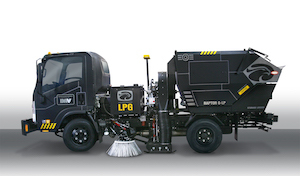 The Advance SW8000 makes for a great parking lot sweeper in Los Angeles and is unmatched for outdoor power sweeping. An industry leading 50 inch main broom – the widest in this sweeper class – combined with full time dust controlled dual side brooms, creates an incredible 77 inch sweep path. On conventional large area broom sweepers, dust is controlled at the main broom and, the side brooms must be raised in open areas to prevent airborne fugitive dust. The innovative DustClear™ Five Stage Dust Control System allows for full time use of the dual side brooms by controlling dust along the entire sweep path – including the side brooms with a fine “fog” that is applied to suppress the dust. 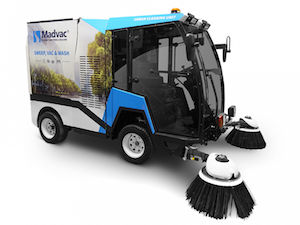 Madvac is the ultimate sweep / vacuum / wash mobile cleaning unit. Versatile, easy to operate, the LS275 can service shopping malls, educational and sports facilities, airports, casinos, amusement parks, seaports, military bases, industrial areas, etc. – in short, any environment that faces litter control issues. Only fully robotic arm on the market, simple operation eliminating fatigue with 270-degree arm movement. Intuitive arm control via 6-position joystick for effortless use. High operator seating and cab offering protection from the elements. Street legal lighting package. Wander hose collects litter up to 15 feet way. 48″ (20cm) Wide vacuum head option. 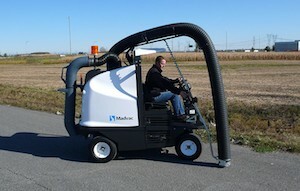 Madvac® PS300 Pedestrian Vacuum Litter Sweeper. 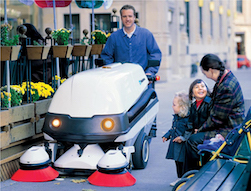 People-friendly sweeper for areas with high pedestrian traffic. Sweeps, vacuums and sanitizes surfaces. 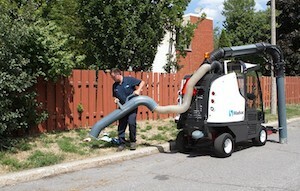 Keeps operator and passerby dust-free; zero dust emissions. Wander hose for hard-to-reach places. Easy access for routine maintenance.